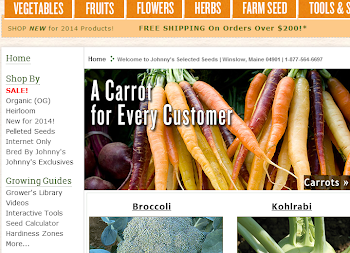 Growing Ideas with Johnny's Selected Seeds: What you think of the new Johnny's site? I can't really compare because this is my first time at going to your sight. But we like what you stand for. We found your company on the Cultivating Life program and website. We are writing a book and would like to include you in it - free of charge. We are writing an inspiring book to "help cultivate ideas" and think your company shows a great example to others. If we can work together please let me know. Sincerely one of your new fans. I like your webpage, but I can't find a link on your website to request a paper catalog. I think the online version is great, but I really prefer to have a catalog I can read through while watching TV and lounging about the house. This may be a turnoff for some customers like myself who like to skim pages in hand rather than browse catalogs online. Oh..nevermind. I found the link to request a catalog. Its small...LOL! 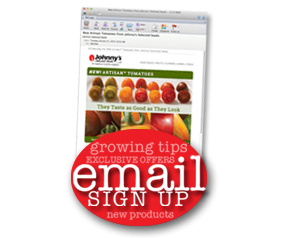 Very Interesting...Very Informative....but where can i click to just order some seeds????? Can't remember what the old website looked like, but it seemed easy enough. Nice selection of Asian vegetables, BTW. Just out of curiosity, does Johnny's have an affiliate program?